Fish feed dryers: Manufactured feeds are an important part of modern commercial aquaculture, providing the balanced nutrition needed by farmed fish. The feeds, in the form of powders, granules or pellets, provide the nutrition in a stable and concentrated form, enabling the fish to feed efficiently and grow to their full potential. The processed “wet” fish feed granules, meal or pellets, can not be transported and stored immediately and require to be dried first. The TEMA Process fluid bed dryers are knNieuw berichtown worldwide for their high quality and efficient operation. By choosing the optimal combination of air speed, air temperature, mechanical movement /residence time, the system can process powders, pellets and granular products with a wide range of grain sizes. 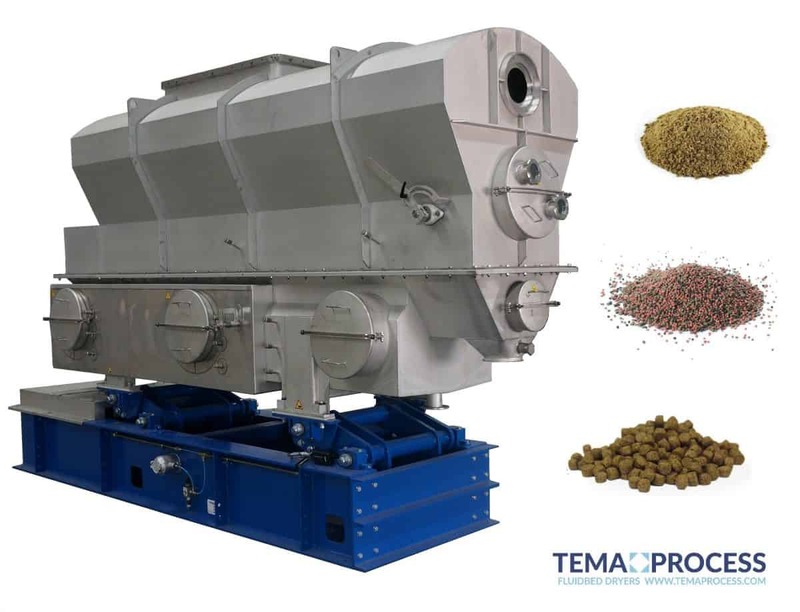 The TEMA Process fluid bed system can accurately dry and cool the fish feed.